Everyone who is on vacation in Barcelona should for sure go to the harbour to see Barcelona's amazing skyline from the water! We offer several options: the sailing boat either as public tour with a skipper or the whole boat for charter as a private tour. For those who prefer to tour on a motorized vehicle, we recommend to attend one of our public or private motor boat tours. Or for the "Cozy" ones a tour with one of the big catamarans, the well-known Golondrinas. All of the offers have one thing in common: the trip is a lot of fun and you will recover in the fresh sea air and escape the hustle and bustle in the city. 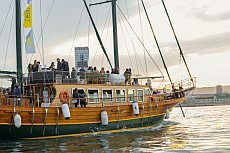 Experience the maritime Barcelona with the "Golondrinas". You can choose between the shorter harbour tour through the yacht harbour, the fishing port and the freight port and the long ride “Port i Litoral”. 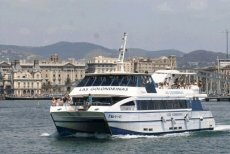 This tour takes you into the open sea along the coast to the city limits of Barcelona at Port Fòrum. Let a fresh breeze caress your face: in a sailing or motor yacht along the coastline. With the yacht charter you have have the yacht for your group alone (up to 10 people). The skipper can respond to your wishes. 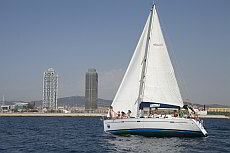 Sail along Barcelona's coast on the Goleta Karya and enjoy the nice atmosphere and the beautiful skyline. Duration 90 minutes. Experience the crystal clear water while kayaking and snorkelling, or relax on the beach and enjoy the fabulous views and white sandy beach. 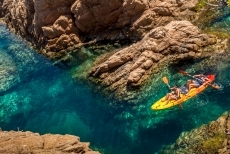 Discover bays, small caves and the colorful underwater world.